This arrowhead is carved out of cattle bone and is wrapped with non sterling wire and has assorted seed beads for decoration. 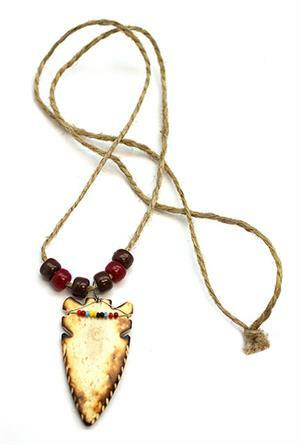 It is strung on hemp cord with colored plastic beads. Arrowhead measures approximately 2 3/8" long including bail by 1 1/8" wide at widest. Cord is approximately 28" long and tied in know at the top. It is Navajo hand crafted by Phillip Corley. Colors of seed and plastic beads will vary and size may vary on arrowhead.